Good morning everyone! Hope you are well :-) I am here with a card ive made in my challenge to myself to get most of my christmas cards done in advance this year! I used a Lili of the Valley James the Bear with Star stamp which I coloured with promarkers, and accented the white areas on the hat with glitter. I cut the image with a spellbinders die and cut a mat for it with the next size up. I used First Edition Silent Night papers, kraft cardstock, 'Happy Christmas' ribbon from Crafty Ribbons here, wooden snowflake and gems. I added pearls to my wooden snowflake to make them prettier. Good evening everyone, hope you are well! Eek! Can you believe how close Christmas is now?! I thought I better start cracking with my Christmas cards because it always ends up being such a stress trying to make them at the last minute. I cant promise myself I will have them all done in advance but at least I know I have made a start! For this project I used Penny Black image coloured with Promarkers and glitter accents, First Edition Silent Night papers and embellishments, Kraft card blank, Bronze cardstock, pearls, sentiment label, twine and eyelets. I began by colouring my image with promarkers and adding glitter accents for snow. I then placed this on a bronze scalloped circle mat. I covered the kraft card with papers then added my image in the centre. I decorated with elements from the Silent night embellishment range, and gems and pearls from my stash. To make the die cut sentiment look better I used a little gold eyelet on the end of the tag and threaded with twine. Good morning everyone, hope you are well :-) I am here with my DT project for Crafty Ribbons where our challenge is 'Tags' this time. I used Crafty Ribbons Vintage Christmas Past collection here with a tag, my crop a dile with an eyelet, Bo Bunny Silent night papers and pearl gems. I started by covering my tag with the Bo Bunny papers and adding my gold eyelet to the top of the tag. I find adding an eyelet means you can use better ribbons as it reinforces the hole to it doesnt tear. I added 'Seasons Greetings' sentiment ribbon for my tag. I then used a fairy tag ribbon as my image and added pearls to decorate. I then finished by decorating the bottom of the tag with another ribbon from this collection. All Crafts Challenge Butterfly Backlit Canvas! Good morning everyone! I hope you are well :-) I am here with my creation for our 'Boo!' 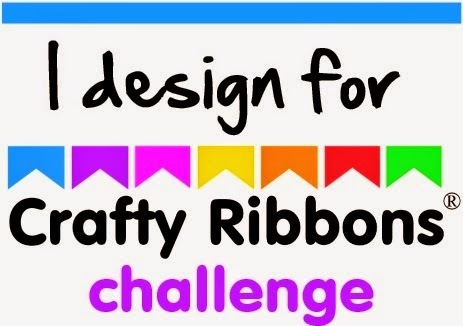 challenge over at A Little Bit Crafty! I wanted to make a CAS card, and I began with my image/sentiment which I have in my stash. I printed this and coloured the pumpkin with copics. I then layered this onto glitter orange, black and then white cardstock. I then made my base by cutting a black panel of card and heat embossing some halloween stamps using silver embossing powder.